This game beat me up, stole my lunch money, and gave me an atomic wedgie. I think I love it anyway. When I heard that the Playstation 4 was getting an HD remake of a hard-to-find Sega Genesis game, I was pretty excited. That excitement only grew when I learned that the game would be getting a physical release in addition to the digital download, would retail for 20 bucks, and that the original Genesis version could be unlocked after you beat the remake. The game was delayed, but finally came out in summer of 2016. I've just gotten around to playing it, and all I can think of to describe the experience is to quote Keanu Reeves and say..."Whoa." 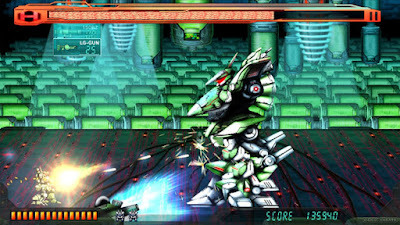 Assault Suit Leynos is the original, Japanese title, but when it was released for the Genesis back in 1990 in the US, it was called Target Earth. It had a generic, white label, weird box art, and no one bought it or played it in 'Murrica because it looked mega-generic. Now the game has been cleaned up with some spiffy new graphics, but they aren't too far from the 16-bit era. I'm gonna be honest with you: the entire time I was playing the remastered game, I thought I was playing the classic Genesis version. A side-by-side comparison proves that the differences are apparent, but they aren't as obvious as you might expect. The HD remake has full spoken dialogue, but it's all in Japanese. The music has been redone, but it's very faithful to the original. Outside of that, I didn't notice a ton of other upgrades. The game is essentially a mecha assault game, meaning that it features big robot suits with people inside them, like in the Gundam anime or even in that movie Pacific Rim. You are the pilot of a mecha who must defend the Earth from an alien race that have targeted (Target Earth) for destruction. Because this game is Japanese, there's a whole lot of story that you get to learn as you play your way through the eight levels. It's actually a really cool story, and would make a fun movie. Maybe someone will get on that when they run out of remakes in Hollywood. I've searched high and low on the interwebs to try and find out if Assault Suit Leynos was the brainchild of one particular person, as these games often are, but all I can find is that it was developed by a Japanese game studio called Masaya. I had hoped that there would be a single person with an authorial vision, but that doesn't seem to be the case. I wanted to find out whose idea this game was, because it's hard to play the game without feeling like whoever was behind it didn't get enough affection during childhood. See, I'm looking for someone to blame. Let me be clear. Assault Suit Leynos is RIDICULOUSLY hard. I played the game on EASY mode, but that setting might as well have been called "Blitz," because it doesn't ever let up. 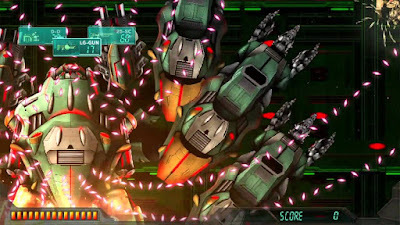 HARD mode should be renamed "The Book of Revelation Mode" because this game often plays like a biblical apocalypse with big robots. "And lo, the eastern sky split and there came unto us a hundred thousand beasts of iron, and men rode in the bellies of those beasts, and lo, those men had hair of blue and pink and red. Their sticks spat forth fire that could not be dodged, and lo, we did use many continues and send our lamentations to the heavens." I've been playing video games for the better part of thirty years, and I can't recall a game that was as difficult as Assault on Leynos. I'm not saying there isn't another game as hard as this one, because there are a ton of hard games out there, especially on classic systems from Sega and Nintendo, but I can't think of one. The first Mega Man for the NES has some brutal and unforgiving levels, but you just have to repeat them until you get the pattern down. This game is the same, in that you have to beat the bosses by memorizing patterns and looking for weaknesses, but I can't tell you how many times I died within a few seconds of hitting "continue." Dozens. Maybe a hundred, especially in the final stage of the game. It would go like this: I would die, hit continue, and then immediately die again. The next time I would continue, I might make it a few steps further than I had the last time, if I was lucky. That's why I think that whoever developed this game needed a whole lot more huggies and snuggies when they were kids than they actually got. This is a punishing game. It's relentless. The term "bullet hell" gets thrown around a lot, but I can't recall a game with more of an inescapable bullet hell than this one. Maybe you remember Contra, from back in the classic Nintendo days (or maybe you were lucky enough to find a Nintendo Classic console over the Christmas holiday and played it there). 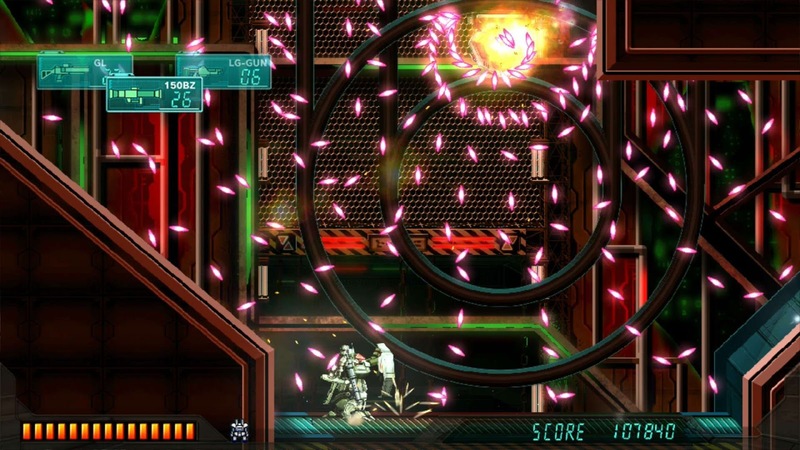 That game threw a lot of bullets at you, but you could dodge them if you were quick on your toes. There are parts of this game when there are literally a hundred bullets on screen at the same time, and your only hope is to whip out your little shield that doesn't even cover you all the way. 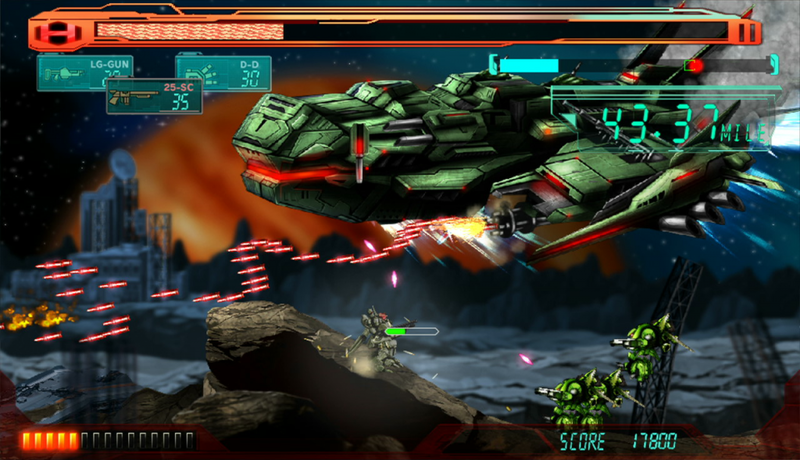 Another frustrating aspect of the game is that you usually have objectives, such as getting to a certain place, escorting vessels, and stopping certain enemies before they get to your base. It gets hard to keep track of what you're supposed to be doing, especially when you're trying to defend yourself against a dozen enemies and decipher what the Japanese person is yelling at the same time. There are subtitles on the screen, but you can't exactly stop and read when you're under heavy fire. They have not made this easy for your average gamer. There's one mission where you have to leave your base ship, defeat a bunch of enemy fighters and mechs, and then return to your own ship before you re-enter atmosphere and burn up on re-entry. Figuring out that you have to land on the platform and walk back through the hatch before time runs out was not easy for me.Nothing in this game is automatic. Nothing happens just because you beat someone. Having said all of that, this game is incredibly satisfying when you actually get past these parts. Too many modern games hold our hands and guide us all the way to the end because the creative team behind the game wants their work to be seen. Assault on Leynos is gonna make you earn it. There will be blood and sweat, and probably some tears, too, but the end result is the satisfaction of knowing that you were beat the game and that it actually means something. People estimate that you can get through this game in about two hours; maybe that's true if you know what to do, where to go, and how to defeat all the bosses. I know I spent three hours just getting through the last stage and figuring out how to beat the final baddie. However, now that I know what to do, I can breeze through the levels a lot more quickly. That's one of the things that I love about retro games: you could beat them in a single sitting, but you came back over and over because you always knew you could do better. These days, games are more about immersive storytelling and realistic visuals; retro games were about memorizing patterns, having lightning reflexes, and learning from your mistakes. I kind of love Assault Suit Leynos. It's not a game that I can see myself sitting down to play for an hour to relax, but it is one that I think I'll revisit from time to time because of the challenge. Also, the game is just incredibly appealing. The anime aesthetic works very well, and so do the mechanics of operating a big mecha. The suit itself feels heavy, and when you use your jet pack, the controls make it feel as if it has a real sense of weight. There are a ton of weapons to choose from, but you have to EARN them by playing really well. You also have to strategize, This isn't a game that you can just blast your way through by spamming the "fire" button. Oh, one more thing: your main weapon is a laser cannon that has forty shots. you have unlimited amounts of ammo, but you have to reload after each forty shots have been spent, meaning that for a solid second, maybe two, you're a sitting duck. Have fun. It's been a long time since a video game has made me scream terrible things at my television set and punch pillows; my neighbors probably think I beat my wife. Congratulations, you sick, twisted, sadistic little game: you owned me. In researching this game, I learned that there were several other games in the series, including a Super Nintendo prequel called Cybernator that I never played and that is reported to be just as hard. Hey, what can I say, I'm a glutton for punishment. 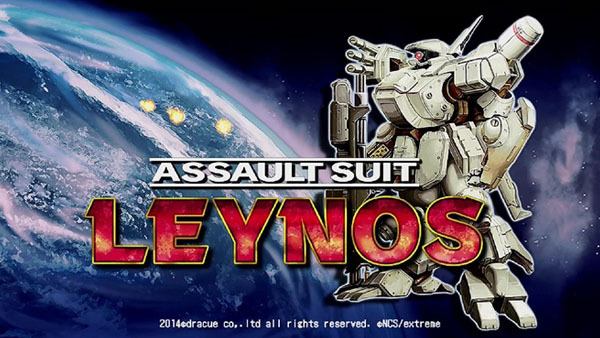 The remastered version of Assault Suit Leynos was developed by Dracue Software and published by Rising Star Games. It's available now for the Playstation 4 in stores and on the Playstation Network. It's also available for the PC.